North Carolina is definitely not your typical breeding ground for rock music. A state which is probably best known for the legendary Andy Griffith Show should therefore come up with equally sweat-drenched greasy music. 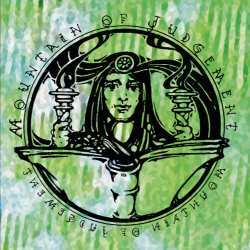 Mountain Of Judgement therefore never sound like a big city band, but combine the gritty simplicity of stoner rock with a heavy dose of psychedelic rock not unlike early Hawkwind. Add to this a sludgy pace which makes for an undeniable doom flair, and you should have quite a good idea of what this quartet is fabricating on its self-titled debut album. Recording sessions began already in 2005, but due to the commitment of vocalist Chad Davis in U.S. Christmas who are signed to the esteemed Neurot Records, things slowed down for Mountain Of Judgement, until they finally completed the album and released it last year on the Russian RAIG label. This may be a strange choice for an American band, but their murky heavy psyche rock actually fits quite well the company’s philosophy. The album starts with the twelve minute long Neptune’s Reign, showing Mountain Of Judgement instantly from their best side. The sludgy pace comes with psychedelic synth wobbles that let you think of a slow motion Hawkwind, while the nasal vocals remind of early doom bands like Black Sabbath and Saint Vitus. Don’t expect things to change after this epic opener. The bands feels at home in doom drenched stoner psychedelia, and crawls their way through the different songs that never run beneath five minutes. After six songs, the regular part of the album is over, but we get two alternative takes from the 2005 sessions where the band had still a grittier sound. Mountain Of Judgement can certainly not claim to have reinvented any genre, be it stoner, doom or psychedelic, but their skilful combination of these three styles with their trademark retro sound still makes for a pleasant listening experience. Fans of the aforementioned bands will want to immerse themselves into the druggy sonic universe of Mountain Of Judgement.